Trailhead and parking area are on Rt. 202 in Antrim, NH. The parking area is 0.9 miles north of where the combined Rt. 31/Rt. 202 splits in the center of Antrim. There are three trailheads with signs for the McCabe Forest. Park at the northernmost and largest parking area, located next to a small garage. For trail directions, refer to the trail map. 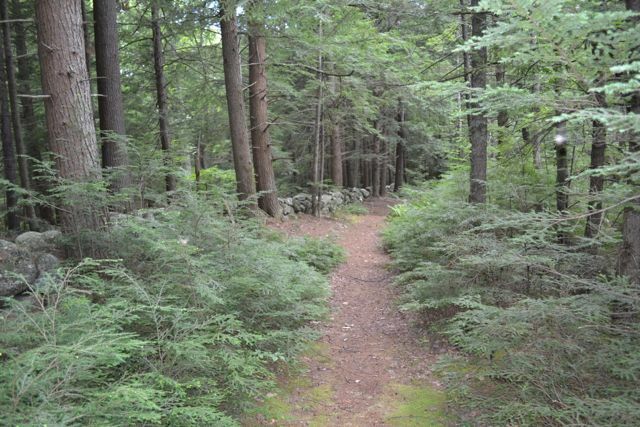 The Forest Society's McCabe Forest contains about two miles of trails around the Contoocook River. The main trail runs the length of the property to make a pleasant river walk. There are many possibilities to make a loop hike, but all the trails are unnamed and blazed in the same color. The trail network is very confusing, so we recommend you either take a photo of the kiosk trail map or just do an out-and-back hike along the river.